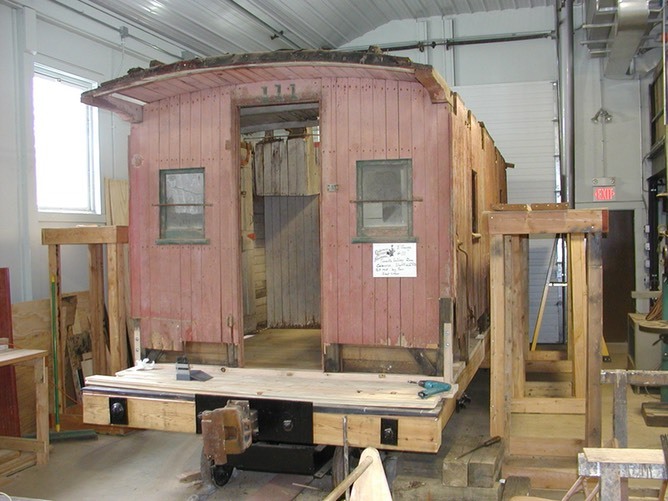 CAMA's Tionesta Valley #111 wood chassis caboose presented new challenges every time we removed another piece of siding. 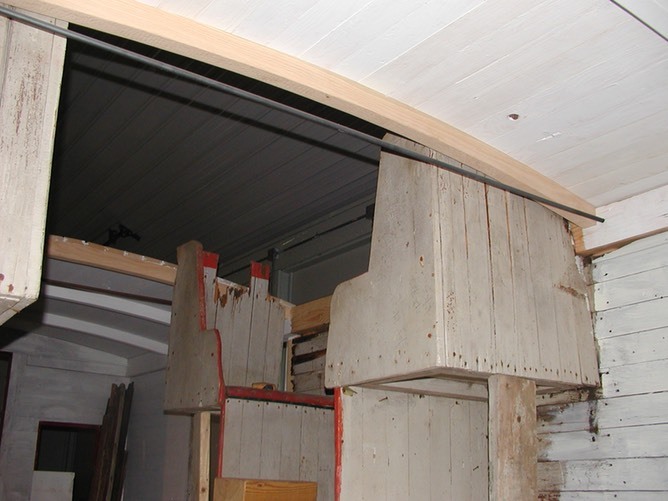 Advanced decay of the chassis and frame became apparent early on in the restoration process. The Condition of Tionesta #111 Prior to Arrival at CAMA - rotten exterior siding, partially buried chassis, and end platforms all but missing. 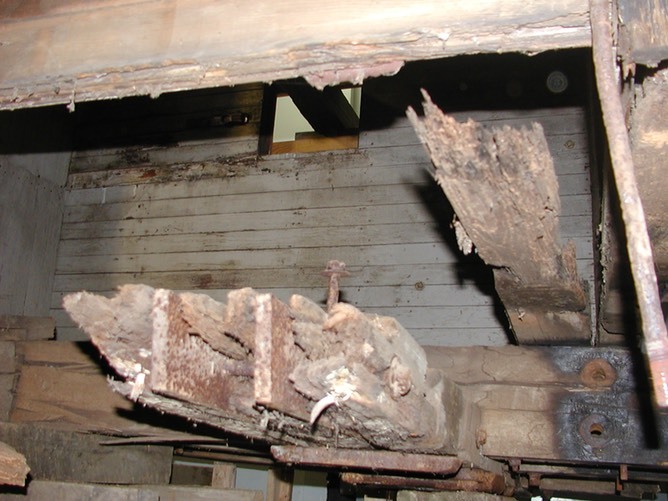 The advanced state of chassis rot is visible of this underside photo of the remains of the body bolsters and main chassis sill beams. The original floor, made up of tongue and groove, full dimension 1.5x6" stock was unusable. 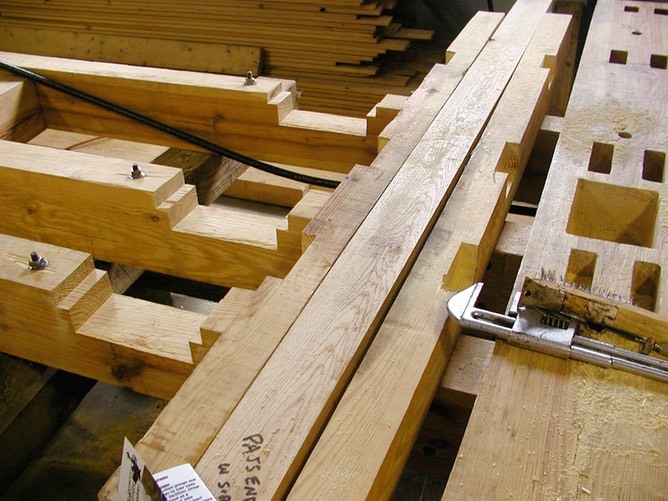 Most of the lumber stock used in the restoration had to be custom cut. 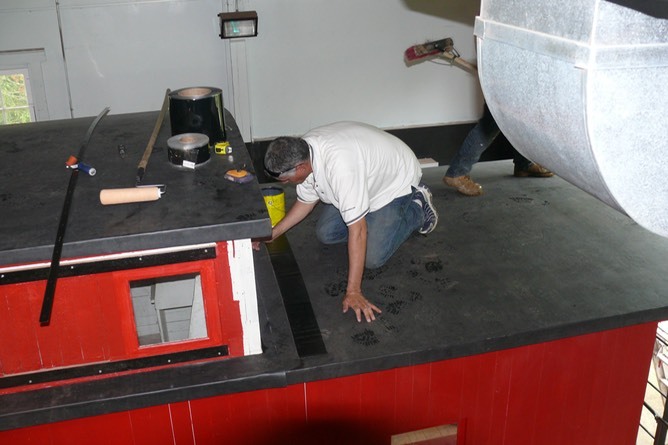 Our restoration was carried out as true to the original as we could manage. Each original piece was removed and measured. 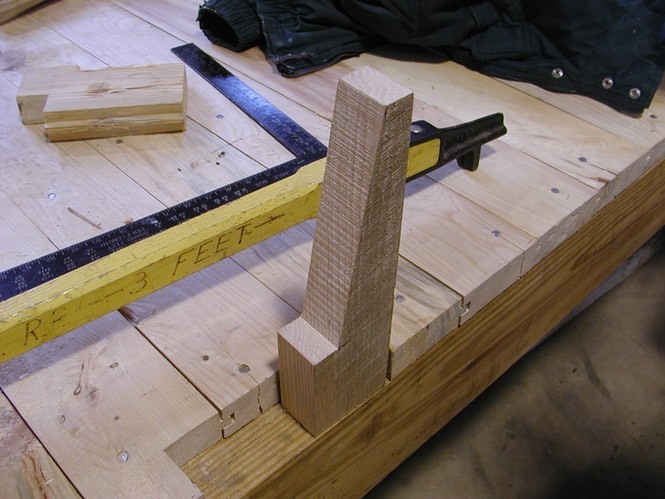 Mortise and tenon joinery duplicated the original whenever possible. Above, the 3 pieces that will make up one body bolster are next to the sill beams notched to receive this bolster. 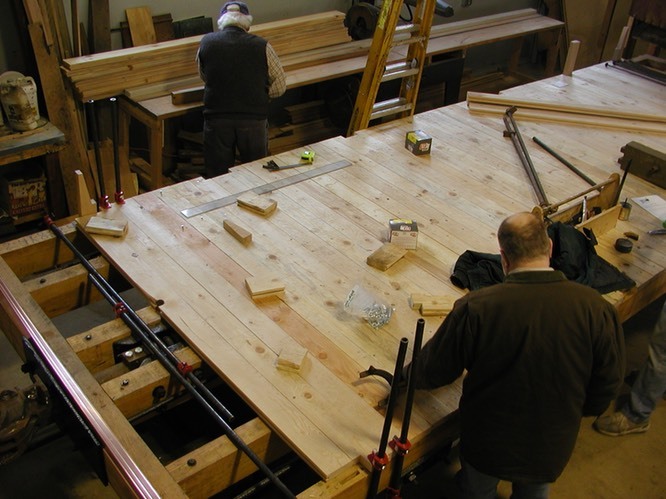 On the far right is the mortised yellow pine end beam. Here, the new end beam is ready to be fit to the Southern yellow pine main/sill beams. The original main and sill beams were made of American Beech which would be impossible to find in these dimensions today. Already bolted into place is the coupler mounting hardware, saved from the original chassis. All the usable original iron hardware was wire brushed, and coated with rust resistant paint. 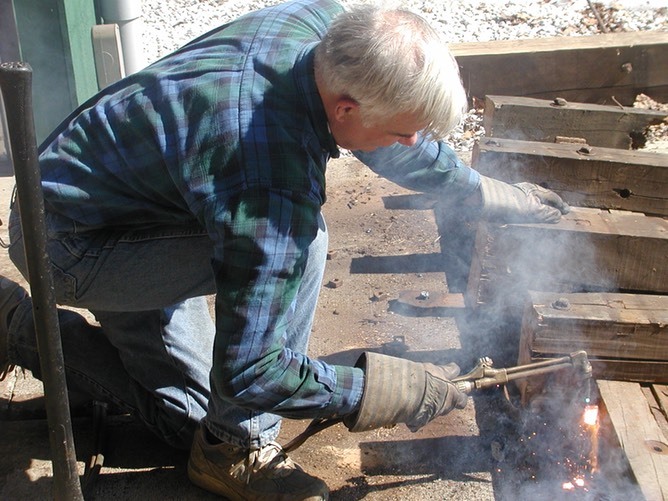 Bob Hungerford torches rusted hardware from the second body bolster. In many cases acid from the wood, combined with atmospheric moisture and rain water leakage, accelerated the corrosion of mounting bolts necessitating replacement. Bob Hungerford measures for the bolt holes to attach one of the the body bolsters to the chassis. The bolster is a "laminate" of native oak and the two original iron barstock reinforcements. The remains of one of the original bolsters are shown in the first photo of this set. The new chassis was built upside down to ease attachment of the original metal hardware saved from the rotted carcass. 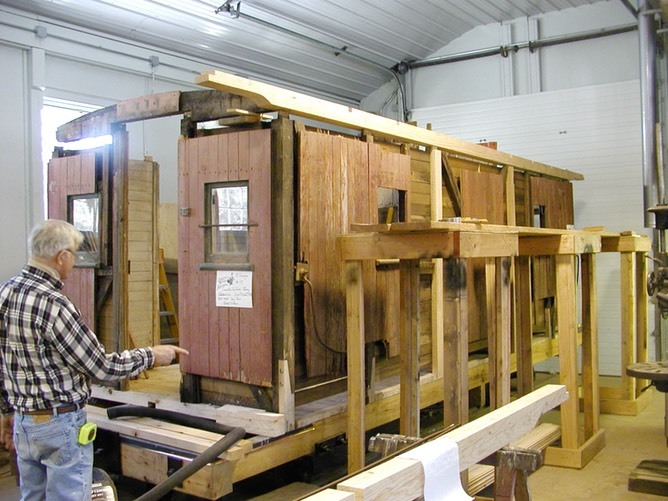 In this photo, the "cabin" can be seen in the background suspended with cribbing. From here, the chassis will be flipped over and coupled with a set of shop trucks. Note the center "King Post" to support the four main tie rods that hold the chassis together longitudinally. Our new chassis sees the light of day for the first time at the 2002 Fall Festival. It is rolling on shop trucks fabricated in-house. The original arch bar trucks were long ago removed from the chassis. 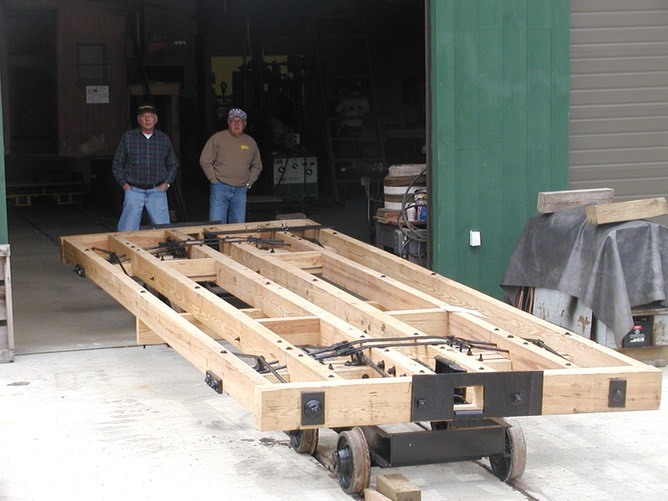 The chassis employs a central "king post" and is held together and stiffened with four 1" diameter threaded "truss" rods running the length of the chassis. The nuts that hold the tie rods in place can be seen on the end beam in this photo. Selective tightening of the truss rods will make the chassis perfectly flat. The four bent tie rods running crosswise front and rear in this photo, stiffen the chassis bolsters where the swivel attaches connecting the trucks with the car. Part 2 - Floor Construction and Joining With the "Cabin"
Once the chassis was completed, it still needs a floor. The floor would also help stiffen the chassis. 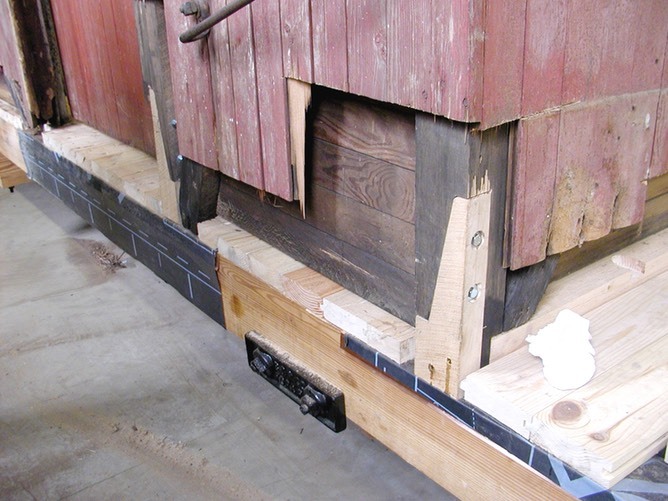 Provisions were made to allow eventually joining the caboose cabin/house to the chassis. The chassis is then joined with the cabin. 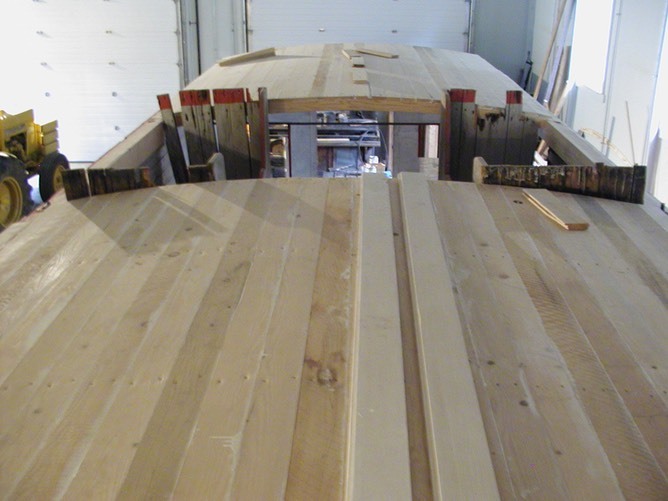 The tongue and groove flooring was first notched on the underside to allow for bolt heads protruding from the chassis. It was then dry fit to assure proper alignment, and then spiked to the chassis. Provision was made in the flooring to allow joining with the house. 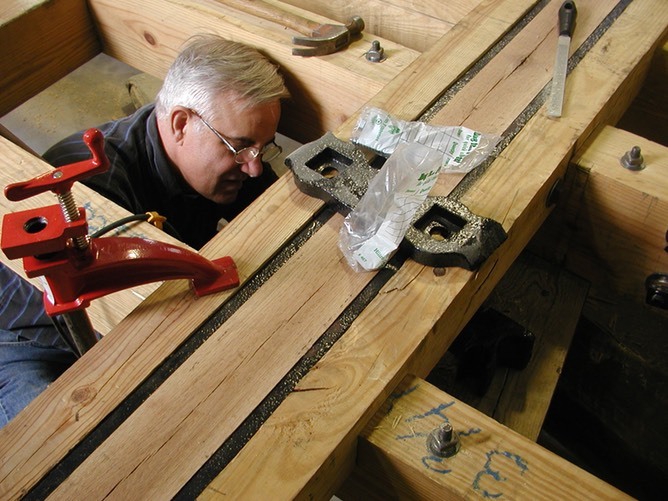 Mortises were cut in the mainbeams and the flooring was notched. The chassis is ready to be rolled under the cabin. Flooring on the two end platforms was not completed pending setting the house into position. The four corner posts of the cabin had considerable rot near their ends but most of the rough sawn oak was still good. Oak cripples with tenons were fitted to these corner posts. 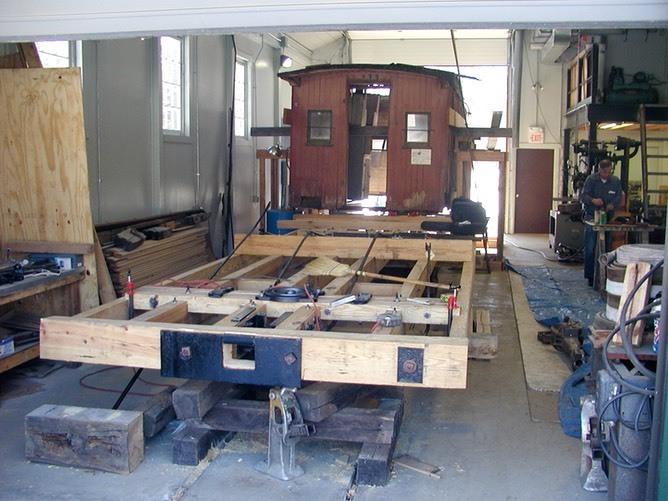 During chassis construction, the cabin was temporarily "hung" from the scafolding and cribbing (visible in previous picture) was removed. The chassis was then rolled under the house and then jacked up to meet the house. 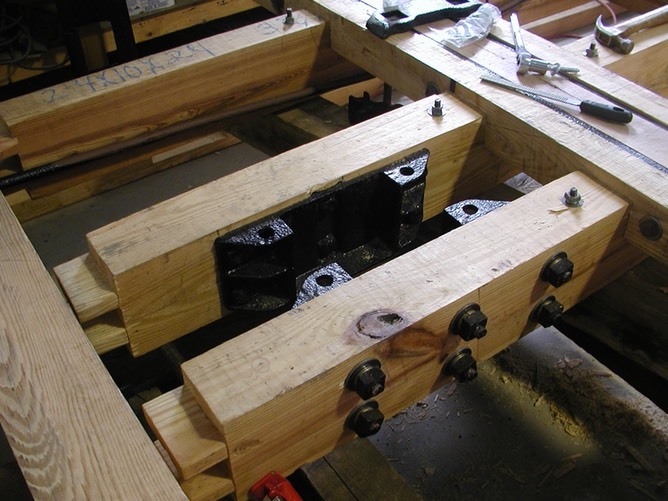 While being jacked into position, the four tenons on the corner posts are mated with the mortises in the chassis. Once the cabin is firmly seated on the chassis, the temporary bracing is removed and the mated assembly is jacked down onto the shop trucks. 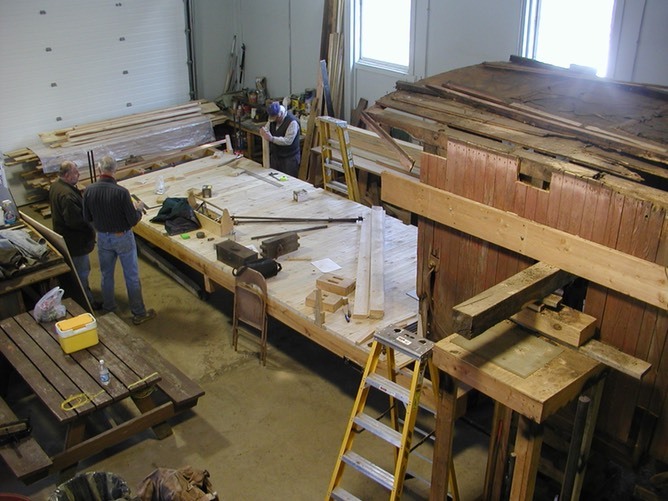 Now that the chassis and cabin/house are joined, work on restoring the house can procede. New posts and beams replace rotted frame members. A new roof and exterior siding close in the house. 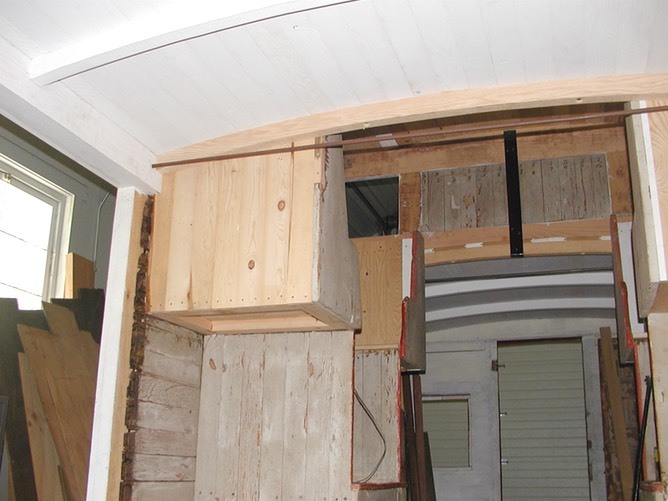 The original interior siding will be saved. A top view, looking down into the hole left from removal of the cupola indicates a long history of water damage. This photo shows the extent of rot in the roof and house framing members. Luckily, most of the original framing and interior siding was in good shape. This photo shows the area under the roof overhang on the platform. Note the use of surplus wood in framing the window. This curve corresponds to the curve of the roof rafters. The four vertical posts below the cupola were completely rotted. 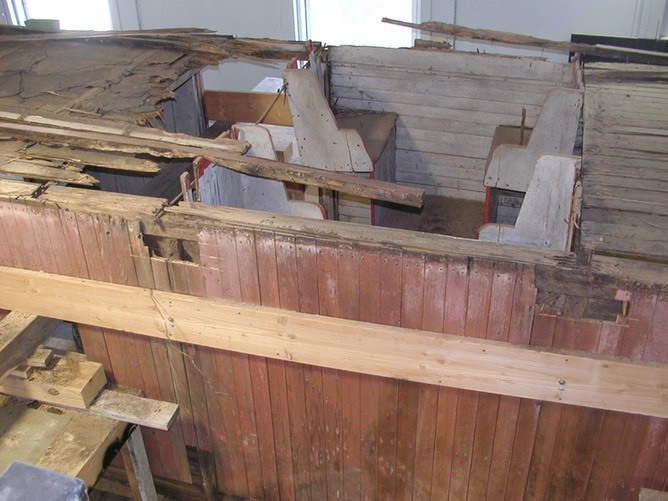 The main beam header for the cabin was rotted into two pieces. All this framing had to be replaced with new wood. 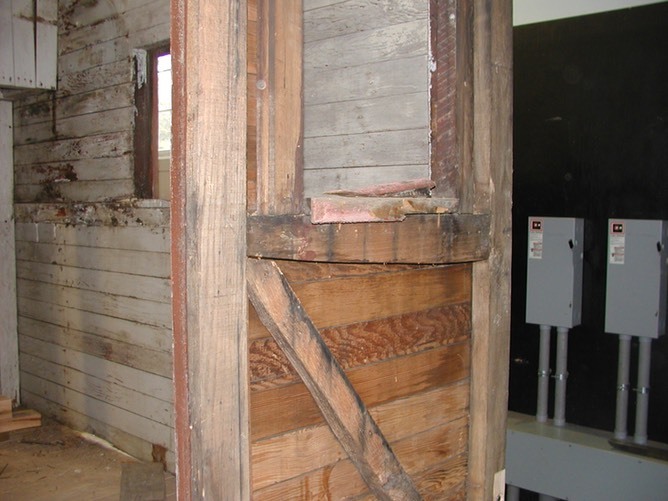 Once the posts and beams were renewed, the threaded tie rods from the original construction that held the cabin together (both horizontally and vertically) were put into place. The use of tie rods to square up and hold the house together is necessary to allow the car flexibility with strength while rolling on uneven track. The horizontal tie rods are more easily seen in the next photo. 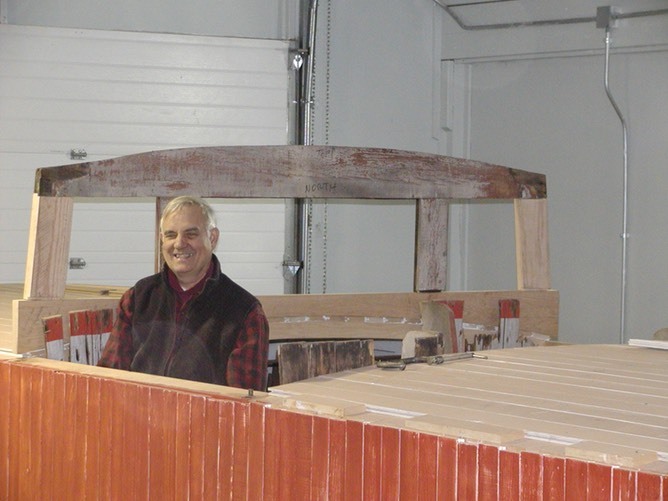 The original rafters were curved lengths of oak. 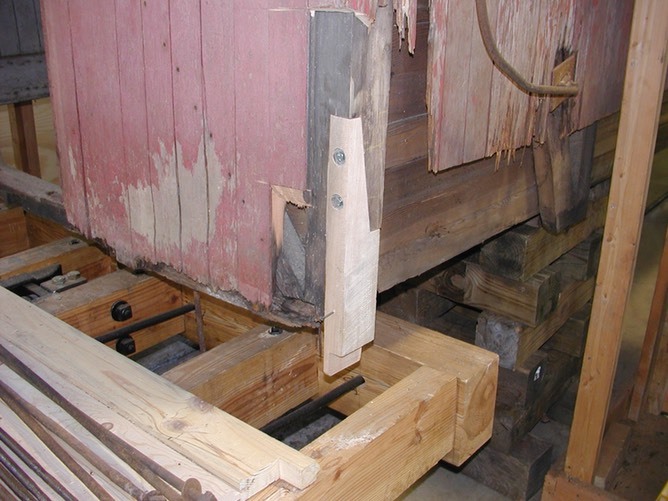 Using the curve of the end wall rafters, we made a jig to reproduce the original curve. It is an arc of an 18 foot radius circle. The same tongue & groove planking used for siding is also used for roofing. The cupola seat nearest the camera is the same seat Mae Golden sat in, in the 1951 photo (see below). 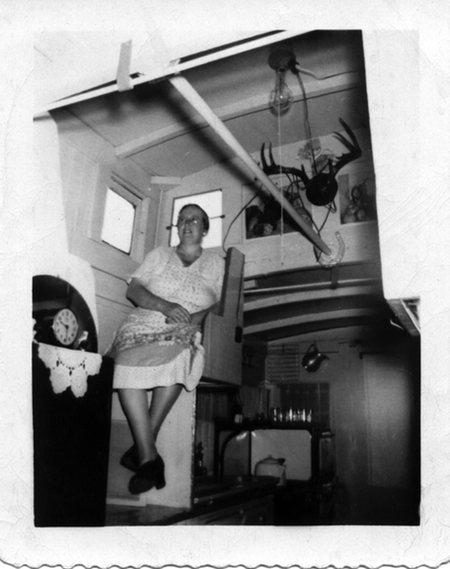 Mae Golden in caboose #111 in 1951, when it was being used as a hunting cabin and food stand. The new roof installed with tongue and groove pine, with all joints pre-sealed to minimize future rot. 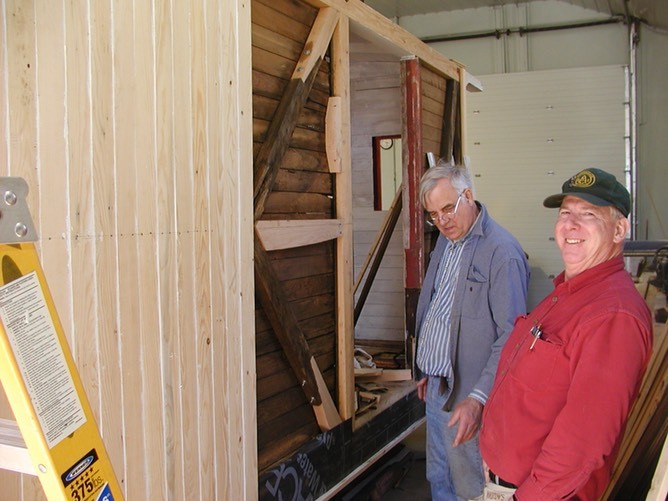 George Cook and Bob Hungerford fit the exterior vertical siding to the four walls of the cabin. In this construction the siding is structural in that it stiffens the entire house. All tongue and groove siding and roofing was preprimed on the tongues and grooves and the interior surface prior to assembly. 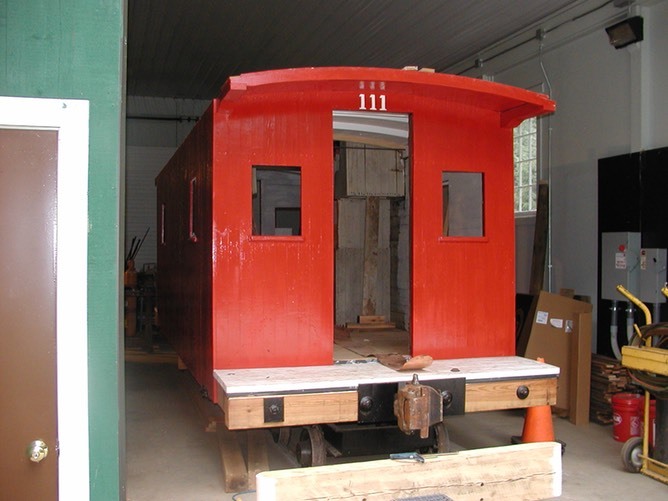 Caboose #111, shown here with two coats of caboose red paint. In this shot, the cupola has not been reunited with the car, but the end platforms have been completed. 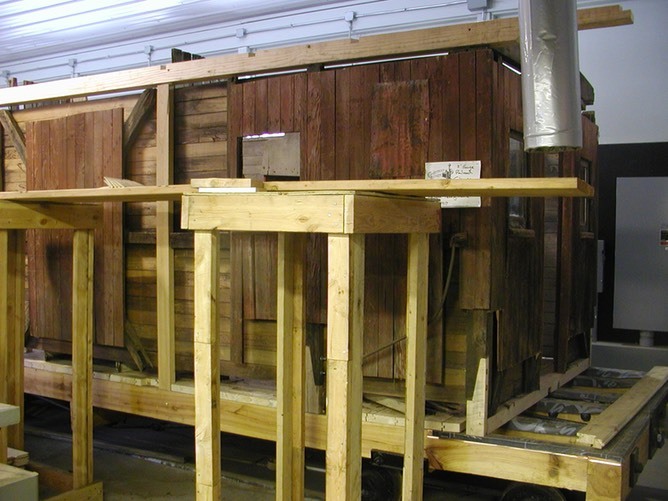 This original coat of paint was deemed too glossy so the caboose was eventually repainted with semi-gloss. 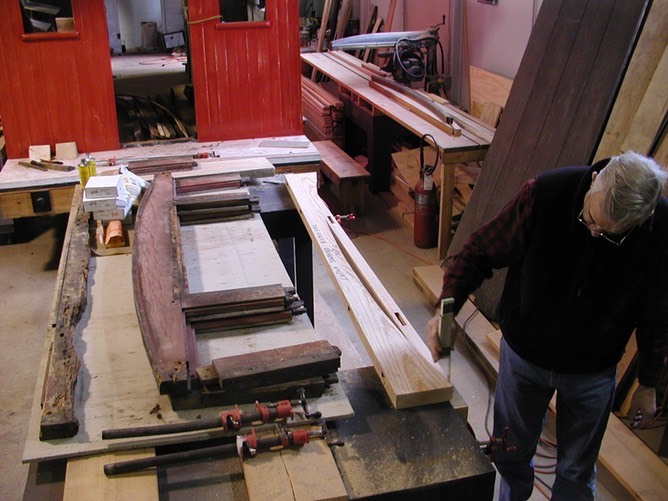 Bob Hungerford works on replacing rotted wood in the cupola frame. White oak was used for support framing. 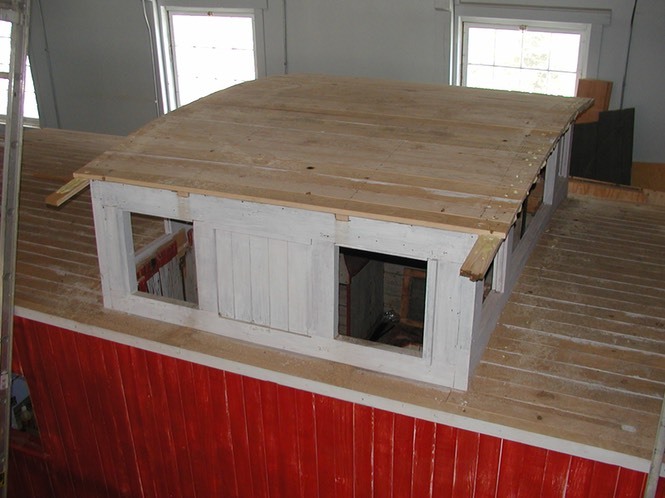 The cupola reconstruction taking shape. As much of the original wood was used as was deemed sound. All four walls of the cupola now in place, waiting for roofing. A detail photo of the cupola construction. 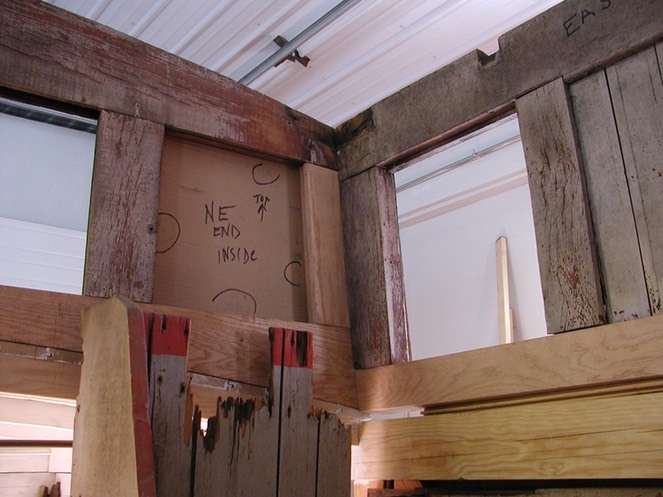 As was the case original, mortise and tenon joinery was used to assemble the panels. The roof installed on the cupola. Rotted seat boards and other rotted interior wood has been replaced. 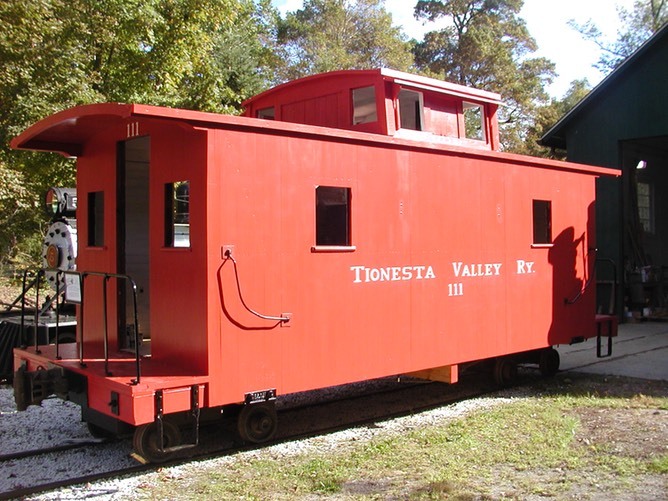 Tionesta Valley Caboose #111 in at the 2006 Fall Festival. Iron railings and foot steps forged in a blacksmith shop have been added. Also awnings on the cupola windows are in place. Couplers have been installed, but #111 is still rolling on shop trucks. 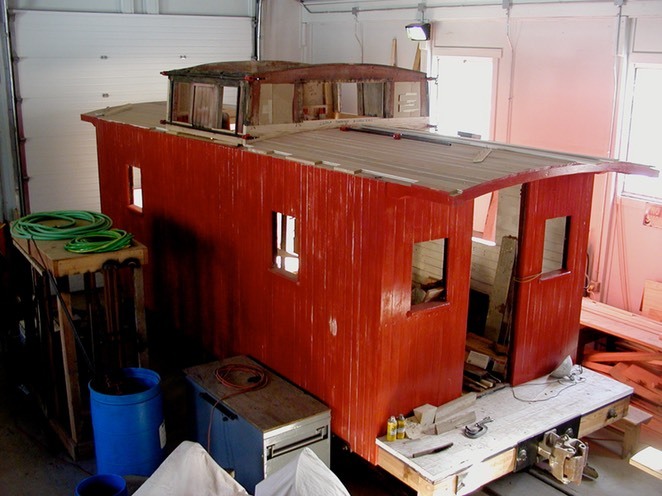 In 2012, the caboose finally got a modern rubber roof. Materials and labor for this work were donated by Barrett Roofing (John and Michael Luchesi). Since this photo, window and door installation was completed by Jim Prentice. 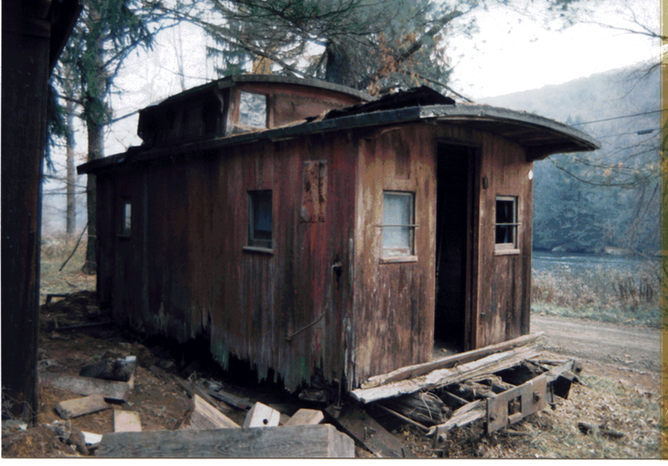 The only remaining work to make this caboose functional involves trucks, brakes and running gear.